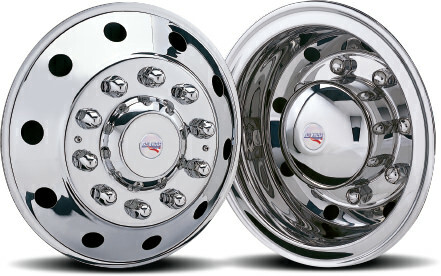 Stainless Steel Simulators offer a front profile and deep rear inset that simulates the look of aluminum wheels. 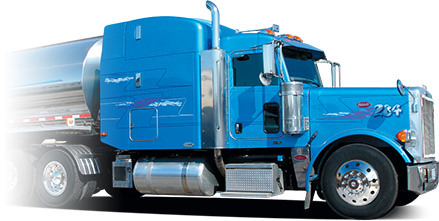 Stainless Steel Simulators really gives your truck an outstanding appearance. 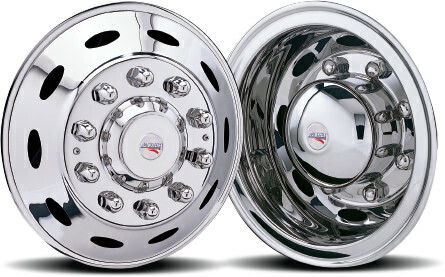 Fits 20 / 22.5 x 7.50 / 8.25 / 9.00 and 22 / 24.5 x 8.25 wheels. For standard hub piloted and stud piloted wheels. Rear simulators fit wide-base wheels. High-quality, non-magnetic 304L stainless steel — will not rust, pit, corrode or turn yellow. Trailer Simulators – Match your trailer wheels to your truck wheels with RealWheels simulators. Engineered to fit securely to steel disc or aluminum wheels with our patented over-the-lug mounting systems.